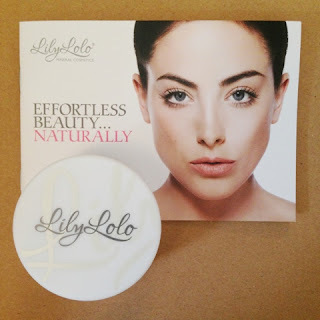 Today I am reviewing the Lily Lolo Mineral Powder Foundation! I've fallen in love with this product so much, and believe it or not, it's amazing at covering blemishes. I've had a rather nasty breakout on my chin recently (non-product related!) and surprisingly when using this, I don't even need to reach for a concealer. This is the first time I've tried a powder foundation, and here are my thoughts! I use shade '001 Porcelain', which is a perfect match for my super pale skin. I don't think I've ever found a foundation that matches so well! I started out by buying a few (very generously sized) sample pots at only £1.49 each to see what shade I needed, and I loved it so much, I immediately ordered a full version. It has SPF 15, (which is better than nothing!) and is oil free, vegan friendly and comes in 18 different shades. It retails at £13.49, which may seem pricey compared to drugstore brands, but it's over £10 cheaper than Bare Minerals, and you get an extra 2g for your money! I've read many reviews on both products, and they both seem to be rated very highly, but Lily Lolo was the winner for me, because of the price and wide selection of pale shades. Before I use this, I moisturise with my Body Shop Seaweed Mattifying day cream, which I reviewed here, followed by a quick application of L'Oreal's Studio Secrets Smoothing Resurfacing Primer. (Which I am going to review soon!) I find these two products create an excellent base, and ensure the powder stays on all day long. I really need to get myself a kabuki brush, as at the moment I'm just using my Real Techniques Buffing Brush, which isn't ideal as it's a bit small, but does the job nicely! Over all, a really excellent product. It really surpassed my expectations, and I'm sure I'll be repurchasing when this one runs out! (Although I can't see that happening anytime soon - there's so much!) I'm also keen to try a few more of their products, such as the Finishing Powder which I also tried in a sample size! One more plus - the postage was SUPER fast - always a good thing! I've never heard of Lily Lolo before, can you only buy it online? I'd be interested to check that out, I love products that do everything you want them to! Would be great if you could added a picture as to what the powder looks like! Is it loose or pressed? I responded back over on my blog to your last comment; enjoyed our little conversation! The stuff on their site looks great! I really like the look of the 'Doll Face' blusher. Looks stunning! So nice that it's all natural as well. The brushes look lovely too. I predict another make up spending splurge! Thanks for introducing this brand! I know, it's all so lovely!! And I don't blame you.. I'll be straight back on there when payday comes around! Not heard of this brand before.. but I've started using sheer cover mineral foundation and not sure if I like it as im used to using liquid foundation but this one sounds enticing might try it out too!